Bruce Trevor Reihana (born 6 April 1976 in Thames, New Zealand). Reihana started playing in the National Provincial Championship level with Waikato in 1996 and led them to two Ranfurly Shield victories out of three. He played for the Chiefs in the former Super 12 from 1997 to 2002 with 58 games and 123 points to his name. Internationally, Reihana represented the New Zealand Sevens in the rugby sevens. He played in the 1998 Commonwealth Games and the 2002 Commonwealth Games, winning gold medals on each occasion. He made 11 appearances for New Zealand Maori. He made his debut for New Zealand against France on 18 November 2000. After not renewing his contract with the New Zealand Rugby Union in 2002, Reihana managed to get an overseas contact with Premiership side the Northampton Saints. He was used at fullback and became an influential figure for the Saints and even won the 2003–2004 PRA Players' Player of the Year Award. Reihana was scheduled to return to New Zealand rugby after his stint in Europe, but it did not materialize as he decided to stay in England. Resuming his career with the Saints, Reihana was promoted to captain after Steve Thompson decided to step down as co-captain. During a 2006-07 Guinness Premiership match against Gloucester on 23 September 2006, Reihana suffered a knee ligament injury that would sideline him until 2007. 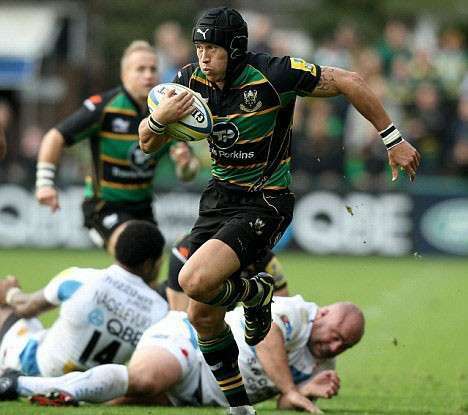 Reihana relinquished the Saints captaincy at the end of the 2008-09 Guinness Premiership, when Dylan Hartley was appointed in his place. On 2 October 2010 Reihana scored 17 points against the Exeter Chiefs to take him through the milestone of 1,000 points for the Saints. Bruce left the Northampton Saints at the end of the 2010–11 Aviva Premiership to join the French team, Bordeaux.